We are trying to determine whether or not we can get thrust out of microwave energy. I agree!! But we need an experiment to prove these things. Given that thrust follows the dielectric and can be controlled at will; it is clear that this is no artifact. With that in mind perhaps its time to revamp the 'Mulletron Mission to Saturn' and combine that with the vacuum test results? Yes, the vacuum tests are not as great as hoped for, but they are a place to start from, and multiple improvements / ways of boosting this devices efficiency have been suggested. So maybe a 'Mulletron Mission' using the unmodified vacuum test info, and a second based on...'reasonable best guess' improvements? Also, with all the images on the web, there must be one out there that captures the essence of the Mulletron craft. Probably not while it's still this early in TRL. There's not much to lose in waiting for what seem to be imminent new empirical data. Elon should employ Rodal, Mullertron, NotSureOfIt et al to examine anomalous thrust. To not do so would be bad business. So you really can put the silly thing into reverse? Don't tell Dodgers. When we can replicate the Chinese 1.0 Newton/kWe demonstrated performance levels that they reported in their 2012 and 2013 tests reports, see attached example from same, perhaps that will be the time to go to the power brokers to see what deal can be had in developing this technology into what it could become. In the meantime, lets ask why 60 watts of relatively harmonic free sine-wave RF power at the 1,937.118 MHz AKA the TM212 resonant frequency in this copper frustum cavity, can only generate a paltry ~60uN, whereas the Chinese claimed to have produce 160,000uN using just ~150 watts of 2,450 MHz RF signals from a magnetron? The magnetron RF signal source that is anything but a pure sine-wave generator, that instead has a modulated FM bandwidth of at least +/-30 MHz that is also concurrently amplitude modulated (AM) with thermal electron noise. IMO maximizing the time rate of change of the E&M energy spectra working in the resonant cavity, along with the optimization of the TBD process that converts this time varying energy density into a unidirectional force pointed in just one controllable direction will hand us the keys to the solar system and beyond. BTW, I have no doubt now that this quantum vacuum derived propulsion system will be able to meet and ultimately surpass my conjectured WarpStar-I concept vehicle performance that I wrote about in my STAIF-2007 paper based on Woodward's Mach Lorentz Thrusters (MLT) of the day. A vehicle that could go from the surface of the Earth to the surface of the Moon with a crew of two and six passengers with luggage in under four hours and then return to the surface of the Earth in another 4 hours with the same payload using just one load of H2/O2 fuel cell derived electrical power assuming 500-to-1,000 N/kWe efficiency MLTs or Q-Thrusters. And yes, I know that's a mighty big leap from the 1.0uN/Watt we currently have demonstrated at the Eagleworks Lab, but if Dr. White's QVF/MHD conjecture is anywhere close to reality, it will be doable, at least in the long term. It is kind of important to my results if you could confirm that the Teflon Rubber gaskets are installed as illustrated in the attached model. Click on the image, it will expand so you can see detail - but of course it is mostly black so use the sliders to move around to find a corner. Right now, I am using a 12.5 mm coaxial dipole antenna at the inner face of the dielectric disk. I know you used a loop of some sort. How much do you think this difference matters considering that I am running a digital model? It is also important that I correctly model the width of the Teflon Rubber gasket filled gap. You wrote that the gasket was .064." Was that after installed, or did you compress it when you tightened down the retaining ring. If so, what would you estimate the actual distance is, between the copper cone and copper base plate, as installed? I know that sounds like a nonsense question, but my simulation shows thrust force is dramatically sensitive to just a small changes in the gap width. I'd like for my model to be as close as is possible to your Copper Kettle thruster. My final question (I hope) re. the gasket is, "Do you know what the dielectric constant is for the actual Teflon Rubber that you used?" (Did your supplier document it, perhaps.) I find values ranging from 2.1 to 2.5 and while force is not very sensitive to this value, it does have an effect. And while I'm at it, I read that the vacuum chamber is 30 inches by 36 inches, diameter by length. Is that inside or outside dimensions? In the meantime, lets ask why 60 watts of relatively harmonic free sine-wave RF power at the 1,937.118 MHz AKA the TM212 resonant frequency in this copper frustum cavity, can only generate a paltry ~60uN, whereas the Chinese claimed to have produce 160,000uN using just ~150 watts of 2,450 MHz RF signals from a magnetron? The magnetron RF signal source that is anything but a pure sine-wave generator, that instead has a modulated FM bandwidth of at least +/-30 MHz that is also concurrently amplitude modulated (AM) with thermal electron noise. Taking a critical look at this question, and knowing that the spectral shape of a magnetron looks like (see below) compared to a CW spike. It seems evident that a CW spike isn't the best waveform to use if you want to maximize thrust. Dollars to donuts says the Chinese are making full use of the available bandwidth of their resonant cavity by using that noisy magnetron. Magnetrons have lots of phase noise too. You can't easily use them on phased array radars because of that for example. Now to put this idea to test, Q: What is the bandwidth of the resonant cavity and what is the 90 percent power bandwidth of the signal you are driving it with? What kind of sig gen are you using? Can it do FM? Can you do any advanced waveforms like a PSK waveform? Do you have a way to produce wideband noise or a spread spectrum carrier for your testing? Can you do any waveforms like at the bottom? One of these driving your amp would be helpful. They go up to 2ghz. When the time comes do you think there will be any difficulty in getting papers on this published? I agree with Mulletron that the answer to Paul March's question is that it is much more effective to have a distributed power spectral density than the power concentrated at a single frequency spike. When the natural frequency changes in an unpredictable manner, it is much more effective to have a distributed power spectral density of excitation (it is the power spectral density ( http://en.wikipedia.org/wiki/Spectral_density#Power_spectral_density ) over the spectrum of changing natural frequencies that matters). The reason for this is that (as has been verified by Prof. Juan Yang in China by inserting thermocouples at different places in the EM Drive) the EM Drive is subjected to a very non-uniform temperature distribution, with the temperature increasing with time, that results in significant non-uniform thermal expansion of the EM Drive, and therefore the natural frequencies must shift with temperature (and therefore shift with time as the temperature changes with time) as the EM Drive expands non-uniformly with time. Therefore, having the power concentrated at a single frequency spike (NASA) is bound to be non-efficient as the resonant frequency changes with time, the EM Drive is going to move out of resonance even if one happens to excite it at the correct frequency to start with. The COMSOL calculations do not provide the natural frequency to enough precision within the extremely narrow bandwidth of a high Q resonance (the higher the Q, the narrower the resonant bandwidth) for NASA to know exactly the natural frequency for a given mode shape. More importantly, the COMSOL calculations do not provide the information needed for NASA to know how to shift the frequency with time, as the EM Drive thermally expands non-uniformly to stay at peak resonance. NASA's reported Q for the vacuum experiment is a meager Q = 6726, which is 17 times smaller than the Chinese reported Q = 117495. Also note that the most efficient mode reported by NASA Eagleworks is the Transverse Electric mode which gave a Mean Thrust of 55 uN with only 2.6 Watts. Instead, NASA Eagleworks has been running most of the experiments in the Brady report in the Transverse Magnetic mode, and the vacuum experiment also in the Transverse Magnetic mode, which NASA's own data (see above) shows to be the most inefficient mode. Why is NASA running the vacuum experiment in the most inefficient mode (Transverse Magnetic) rather than the most efficient mode (Transverse Electric) ? Because they report difficulties in tuning the EM Drive under the Transverse Electric mode. Prior to the TM211 evaluations, COMSOL® analysis indicated that the TE012 was an effective thrust generation mode for the tapered cavity thruster being evaluated, so this mode was explored early in the evaluation process. Figure 22 shows a test run at the TE012 mode with an operating frequency of 1880.4 MHz. The measured quality factor was ~22,000, with a COMSOL prediction of 21,817. The measured power applied to the test article was measured to be 2.6 watts, and the (net) measured thrust was 55.4 micronewtons. With an input power of 2.6 watts, correcting for the quality factor, the predicted thrust is 50 micronewtons. However, since the TE012 mode had numerous other RF modes in very close proximity, it was impractical to repeatedly operate the system in this mode, so the decision was made to evaluate the TM211 modes instead. Why does NASA have difficulties running the EM Drive in the more efficient mode (the Transverse Electric mode) ? Because the most efficient mode results in greater shifting of its natural frequency with time. Hence I agree with Mulletron that instead of having the power concentrated at a frequency, for a problem where we know that the natural frequency of the EM Drive changes with time in a difficult to calculate and predict (with enough precision) manner, the best solution is to have the power distributed over a wider spectrum of frequencies, as done by Prof. Juan Yang in China. A microwave resonator system is made, which has a tapered resonant cavity, a microwave source, and a transmission device. 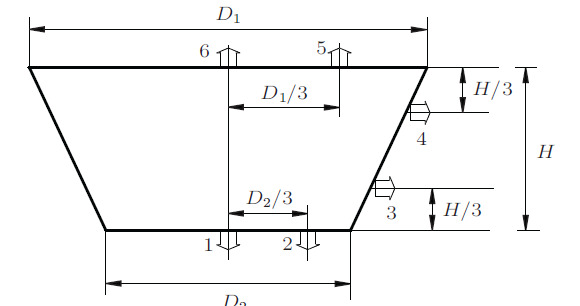 Because of the electromagnetic pressure gradient on the tapered resonant cavity, a net electromagnetic force along the axis of the cavity may be observed, which is needed to verify experimentally the use of the independent microwave resonator system. It is also needed to keep the independent microwave resonator system in resonating state, which is the important procedure to demonstrate the possibility of net electromagnetic force. Thus, a low-signal resonating experiment on the tapered resonant cavity combined with resonating parts is completed to accurately find out the resonant frequency of 2.45 GHz and to analyze the influence of temperature on the resonant state. Experimental result shows that the resonant frequency and quality factor of the independent microwave resonator system are 2.44895 GHz and 117495.08 respectively. When the temperature of the tapered resonant cavity wall rises, the resonant frequency will be decreased and the quality factor changed separately. Notice that China's Prof. Juan Yang shows the force "F" directed towards the small base of the truncated cone. The same end (the small end) that gets heated up the most and gets heated much faster in the Chinese experiment: the small end..
Notice that the increase of temperature vs. time (31 deg C = 56 deg F increase in 40 seconds) of this truncated cone is much higher than the increase in temperature reported by NASA (this is expected because the Chinese run their experiment with higher input power than NASA), because they run their experiment in Transverse Electric rather than Transverse Magnetic mode, and because the Chinese measured the temperature at the correct location: on the inside of the EM Drive with thermocouples, while NASA reports the temperature measured by an IR camera on the outside surface of FR4 fiber-reinforced epoxy, which has very low thermal diffusivity and hence masks the true inner temperature. The Chinese report that they run their experiment in Transverse Electric (TE) modes. "the electromagnetic field intensity calculated in the vicinity of the axis is larger, therefore the center of the small end has a higher thermal energy, thus heating quickly,"
"we measured the cavity surface surface temperature at different locations as shown in Figure 11 with a thermocouple. [Fig. 11, which I attach below shows the positions of the thermocouples noted as "1" to "6"] Temperature measurements at different points vs. time, are shown in FIG 12 [Fig 12 which I attach below shows the temperature vs time at the 6 different thermocouple locations]. The temperature at the center of small end [thermocouple #1] first began rising rapidly." Notice that the temperature of the small end (thermocouple #1) rises much more than the temperature of the big end (thermocouple #6). Notice that the rise of the temperature vs time at the center of the small end is nonlinear (the upper temperature curve) while the temperature measured at the other locations show fairly linear behavior. Maximum temperature is reached at the center of the small end. The heating profile is completely different from the one shown by Egan. How much of the table do we have for the Chinese ?